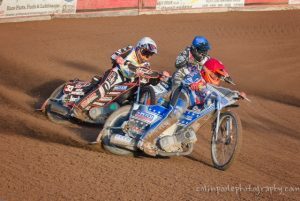 Redcar SG Petch Bears closed the gap to the top 4 in the league, with a 52-40 win over the Edinburgh Monarchs at the Media Prima Arena on Thursday. On a warm evening on Teesside, it was the Monarchs who started the faster with a 4-2 in heat 1 thanks to Sam Masters and the returning Theo Pijper. That was as good as it got for the Monarchs however, with Coty Garcia and Danny Ayres getting a 5-1 to give the Bears a lead which they never relinquished. With the Monarchs 10 points adrift going into heat 10, Erik Riss was sent out in the black and white helmet for double points, but he could only manage second as the excellent Jonas B Andersen powered home for the win and hopes of a Monarchs comeback never recovered. Four shared heats followed, meaning a 5-1 for the Monarchs in the last heat would have seen them go home with a consolation point. Man of the moment Ben Barker shot out of the gate to take the win, after having to fight off a challenge from Sam Masters. Masters himself had to fend off a strong challenge from Andersen, but it meant the full 3 points for the Bears and no points for the Monarchs. A great result for the club with all the team pulling together and getting points at vital times. We managed to nullify their tactical ride move and went on to win more comfortable they expected. For the Bears, Barker top scored with a excellent 13, whilst Andersen had arguably his best night of the season with 11+1 but it was a solid team effort throughout. For the Monarchs, Masters and Riss were both excellent with 13 each but they lacked support from the rest of the side. Next Thursday, there is no home meeting at the Media Prima Arena as the Bears travel to Sheffield. The next home meeting is on Friday, with Sheffield travelling to Teesside in the reverse fixture.